In his brief career Lanza made a surprisingly large number of definitive recordings, and surely this is the yardstick by which we measure any great singer’s legacy. recording of The Student Prince), religious songs ("The Lord’s Prayer," "Guardian Angels"), the one-of-a-kind "Song of India," Edwardian-era ballads (the MGM "Because"), Neapolitan, Spanish and Italian songs (“Granada,” the 1955 “Torna a Surriento,” the 1949 "Mamma Mia, Che Vo' Sape? "), and, of course, opera. While Lanza never actually recorded a complete work, despite singing two roles on the operatic stage (and learning an additional five), his legacy of arias and duets abounds with some astonishing renditions: the 1949 "Che Gelida Manina," "M'appari'," several splendid versions of "Vesti la Giubba”, the Monologue from Otello, and many many more. But if I were allowed just one collection for that proverbial desert island, it would be the Neapolitan album Mario! Recorded just ten months before his death, this disc captures the mature Lanza at his most compelling. This is the later voice: darker and rounder, while Lanza's singing is alternately sensitive and passionate. The baritonal quality that had so confused the choleric Mr. Baron is very much to the fore, while the upper register retains its effortless top. I find myself returning to this album again and again, marvelling anew at the insight that Lanza brings to these often desperately haunting Neapolitan songs. "Passione," "Canta Pe’ Me," "Fenesta Che Lucive," "Tu Ca Nun Chiagne,"and "'Na Sera 'e Maggio;" these are all unforgettable. But for me, one song in particular stands out as the most soul-baring piece of singing he ever delivered: "Voce 'e Notte." This is Lanza’s vocal cri de coeur. The song expresses the anguish of a lovesick man, alone in the night, looking up at the bedroom window where his beloved now lies in the arms of her husband. If ever a person wanted proof of Lanza’s complete identification with his material, then this recording is surely it. While in Rome I once reduced a family of Neapolitans to tears with this rendition. "For God’s sake, put something happy on --- quick!" urged my New Zealand travelling companion, alarmed by the family’s reaction. But he needn’t have worried. That family’s spontaneous display of emotion said it all, and no artist could have asked for a greater compliment. 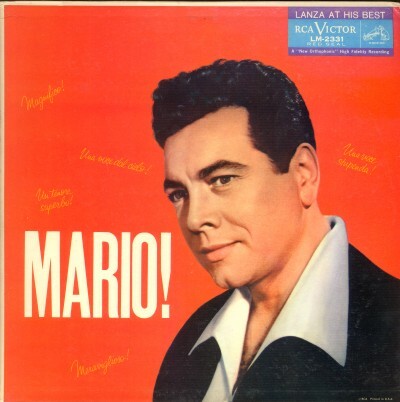 Mario Lanza: I salute you.